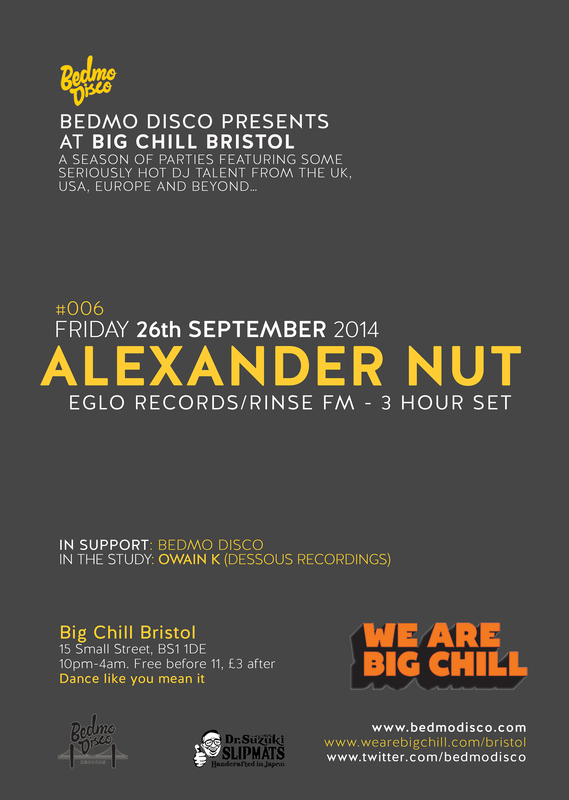 This Friday sees the mighty ALEXANDER NUT head to Bristol to play the latest instalment of Bedmo Disco Presents. We’ve been making a song and dance about this for a while – we’re genuinely excited about the party. We won’t bore you with the usual spiel, but suffice to say we think it will be one of our best yet. We’ve teamed up with our friends at Don’t Panic to give away a bunch of tickets (well, guest list, as we’re not printing tickets in advance). You can find out all the details and enter by clicking on the link below. Good luck! Ever since we launched our Bedmo Disco Presents… series back in April. we’ve been working hard to put together a strong line-up of guest DJs for our autumn schedule. We’re excited to finally be able to announce the guests for our next three parties. We’re biased, of course, but we think it’s a killer line-up. 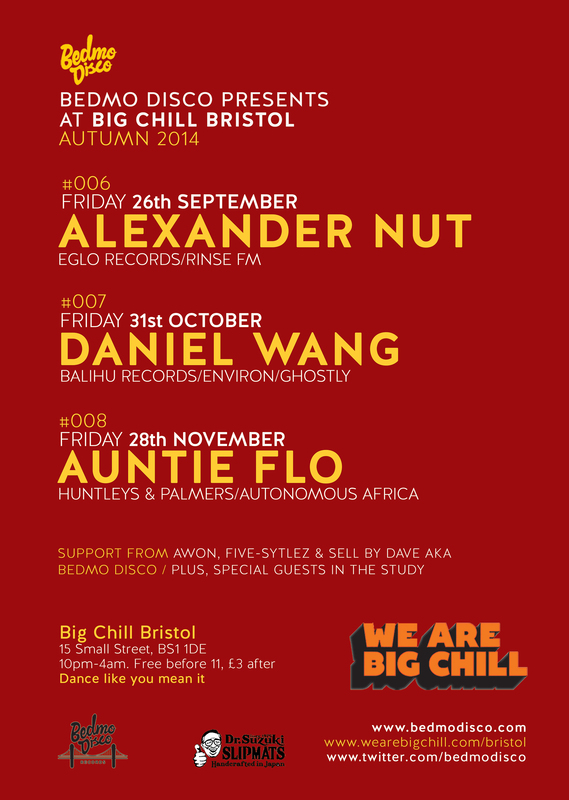 First up, on September 29th, we’ll be welcoming Eglo Records boss, Rinse FM DJ and killer party-starter ALEXANDER NUT to Big Chill Bristol. We’ve been enormous fans of Alex’s mixed-up, anything-goes-as-long-as-it’s-soulful approach to DJing since we first heard him play at UFO in Bristol a few years back. We’ve been lucky to dance hard to his sets on numerous occasions since, and he always kills it. For his appearance at Bedmo Disco Presents, Alex will be playing for three hours, joining the dots between boogie, soul, disco, broken beat, modern soul, house, funk, hip-hop, techno futurism and everything in between. It will be deliciously soulful and dancefloor-friendly. Knowing Alex, he’ll also get on the mic, probably after sinking copious amounts of rum. It will undoubtedly be special. While Alex is rocking it downstairs, our old friend OWAIN K from Cardiff will be joining the dots between styles up in the study. He’s an excellent DJ and a talented producer, too, as anyone who has checked his releases on Dessous Recordings will tell you. Then, on the final Friday in October, we have a very special treat for anyone who loves disco: a return to Bristol for the effervescent DANIEL WANG. Now based in Berlin after years spent earning his stripes in New York, Danny is without doubt one of the finest disco DJs around. His record collection is absurdly deep, and he always gets a party going. He’s only played in Bristol twice before – at UFO first, then at the Motorcycle Showrooms in 2013 – but both times he absolutely killed it. We’re delighted to have him on board, and look forward to hosting him. He’s something of a legend, all told, having spearheaded the first wave of “nu-disco” in the late ’90s and early 2000s – first with his own label, Balihu, and later on Morgan Geist’s Environ imprint. He’s also released material on Ghostly International, while his latest re-edit 12″ under the Otto Gelb alias (simply titled Volume 3) is – predictably – another killer. We’ll write more about Danny and his long career closer to the time. Finally, in November, we have Huntley’s & Palmers resident AUNTIE FLO. Those with an interest in the modern wave of African-influenced music – and Afro funk and afro0-disco full stop – will know all about the London-based Glaswegian. He’s released a mixture of killer edits (a number on the excellent Highlife Edits series) and original material for the likes of Permanent Vacation, Autonomous Africa and Kompakt Extra. His original music is particularly exciting, as it blends African rhythms with contemporary electronic styles and all manner of global influences. He’s not played in Bristol before as far as we can make out, so it will be thrilling to give him his debut in our fair city. For all of these parties, we’ll be addressing the sound issues that some have complained about. We’re going to be tweaking the system and repositioning the speakers, with additional stacks, to get a warm, rich sound befitting the quality of the music. We’re heads, and sound is of massive importance. The venue has given us their blessing to do this, and we’re working with sound engineers to get it right. It should enhance what will be great parties. Don’t forget we’ll also have a 4am licence for these, special guests in the study, and ourselves warming you up and sending you home happy at the end. Oh, and it’s always going to be £3 in, so you can come and “dance like you mean it” without spending a fortune. We’ll be talking more about our guests and these forthcoming parties on September’s Bedmo Disco Radio, which takes place tomorrow (Tuesday 2nd September) on www.infader.fm, starting at 8pm.